Social Justice In Early Childhood is a not for profit, politically active organisation working for social justice issues pertaining to the lives of children. It’s members consist of early childhood teachers and educators, consultants, academics, researchers, managers, community people, and those generally interested in the rights of children. Although the group is Sydney based, there are both national and international members. The Social Justice In Early Childhood group hosts an annual conference titled “Throwing the baby out with the bathwater”, as well as other affordable professional development opportunities. Our activist work includes a range of political campaigns. Lobbying across political parties is central to the group’s success. This 3rd edition of The Anti-Bias Approach in Early Childhood is a celebration! 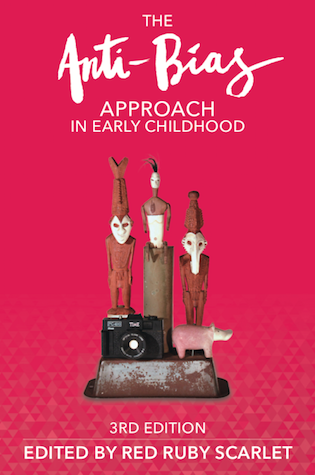 This edition revisits and builds upon the content from the two previous editions to include research and practice that has shaped early childhood over the past 15 years. The pages of this edition hold the stories of the original editor – Elizabeth Dau along with many of the original contributors. Also nestled in these pages are the stories of over 50 early childhood educators who share their powerful stories of anti-bias curriculum approaches. The content of this book is essential to everyone in the early childhood community as we work together to make children’s lives beautiful and inclusive in pursuit of a fair and equitable world.